© Estate of Roy Lichtenstein. Photograph by R. H. Hensleigh. Roy Lichtenstein began a series of paintings called the Modern series in 1966 in which he paraphrased art history using the language of Pop Art. In Modular Painting with Four Panels, No. 7 the source of inspiration was the geometric Art Deco style of the 1930s, such as ocean liner lounges and theatre foyers, and the commercial reproduction of Art Deco designs in the mass media. 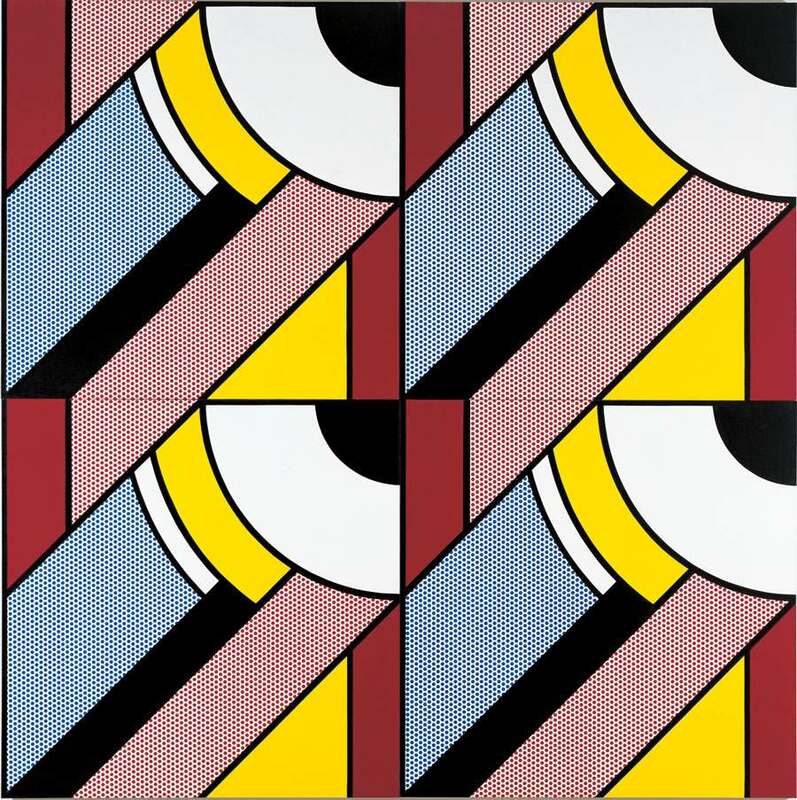 Lichtenstein cleverly parodied the typical Art Deco fascination with the world of technology and industry by creating a pattern based on four gigantic mechanical-looking shapes, which employ an inexpensive product of mass culture as their monumental subject. The high art simulation of this strongly geometricized and rigorously structured composition is deflated by the use of the comic strip vocabulary— benday dots and stenciled shapes outlined in black. Notwithstanding its implicit humor and playfulness, the painting makes an important statement about the postwar explosion of commercial imagery, which was recognized by Pop artists as a vital force in American culture.